This series tracks news and views from our ‘Evidence-Based Policy Research Methods’ (EPRM) course. Many participants work at the highest of levels, both nationally and internationally, including for other parts of the UN system. They come to Maastricht for this unique blended learning programme, covering three weeks in class and 10 weeks online. 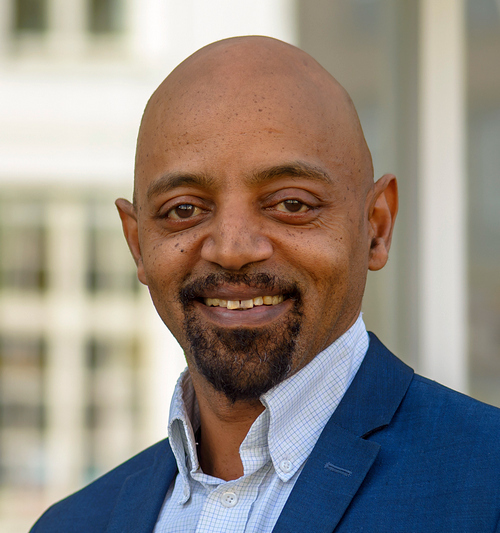 This time we speak with Kitaw Yayehyirad Kitaw, who works for the International Telecommunication Union in Geneva and is now also a part-time PhD Fellow at UNU-MERIT. Why did you enroll on our EPRM course? After over 15 years at the International Telecommunication Union (ITU), a UN specialised agency on information and communication technologies (ICTs), I felt it was the right time for me to design and execute a research project combining my professional experience, academic interests and certain gaps that I have witnessed in the field of ICTs and policymaking. With a MBA in Management of Technology and Computer Science background, I was not sure I had the necessary know-how to engage in a multi-disciplinary academic research field and wanted to improve my research skills without leaving my current employment for a long period. As such, a short course on Evidence Based Research Methods came in as a perfect fit for what I was looking for. I was also seeking to develop aptitudes to better identify purposeful and innovative partnerships between academia and international organisations like ITU by liaising with one of the UN’s research and training centre such as UNU-MERIT. At the same time, I wanted to widen my competencies (relating to research) that could be used in my organisation. How did you find combining work and study over this 12-week programme? Initially I was uncertain if I would be able to find the necessary time to combine studying and work. However, the modular approach was extremely helpful as it allowed me to register for the first module held in Maastricht and gauge the amount of studying required. The flexibility of having separate modules permitted me to make an informed and realistic assessment of my capacity to combine work, study –and family! The first weeks were extremely demanding, as there is an overwhelming amount of reading and writing. This included 12 hours of study per week and the writing of critical analysis (approximately 3000 words per week) on various research papers (and their methodologies) on topics including Migration, Economic Development, Innovation, Governance, Institutions and more. As the weeks went by, through an effective time management and prioritisation, I scheduled my days (including a few hours on Sundays) to work on the assignments — and indeed managed to cope with the high-paced studying rhythm. I have also taken the necessary predisposition with my work, for busy periods where delegation and prioritisation is essential in dealing with certain peaks, but it was challenging to manage. It all worked out perfectly! What are the main benefits of having done this course, in terms of your work? EPRM largely exceeded my expectations and it was instrumental in drafting a sound research proposal to be accepted on to the Dual Career Training Programme to obtain a PhD in Governance and Policy Analysis (GPAC²), which I am currently pursuing. The courses allowed me to acquire, sharpen and solidify my methodological skills. Being equipped with the fundamental tools for designing and critically analysing evidence-based research, I now follow a more structured and systematic approach in parts of my work requiring research. In addition, the good working relationship with the modules’ tutors, with whom we could have Skype meetings, provided a unique learning experience. Being equipped with the fundamental tools for designing and critically analysing evidence-based research, I now follow a more structured and systematic approach in parts of my work requiring research. Evidence Based Policy making is often referred to and highly valued in my organisation. As such, the ERPM course allows me to provide theory-based, structured and sound inputs to the ITU as it seeks to help its member states in using ICTs towards the achievement of the SDGs.